In 1881, a young man called Peter Doherty was shot dead by persons unknown near Craughwell, County Galway. This was treated as no common murder, for this was at the height of the Land War convulsing the country. Doherty had been in dispute over a twenty-acre holding of land, having purchased it over another family. A local meeting of the Land League had condemned this, and when the Doherty family refused to vacate their newly purchased property, a boycott against them was called. Shortly later, Peter Doherty was dead. His murder was but one of eight that occurred over land between May 1881 and June 1882 in South Galway, a pattern that gave reputations to the county as dangerously unstable and to the authorities as impotent in the face of such so-called ‘agrarian outrages.’ It was against this unsettled backdrop that the authorities were determined to make the persons unknown known, by any means possible. Many books on the Land War keep to the general picture or to the prominent political individuals involved, so it makes for an interesting change for one to focus on the ‘ordinary’ people caught up in the sweep of events. And caught up they were. Two men were arrested for the murder and convicted in a trial that relied heavily on the flimsy and contradictory testimony of police informants whose accounts were cast in doubt even by their wives. The initial sentences of death were commuted to life, out of which both served nearly twenty years. In an age that has continued to see miscarriages of justice, allegations of police misconduct, and the issues of the use and influence of police informants, the case of the Craughwell Prisoners seems all too relevant. One of the two convicted was Pat Finnegan, the grandfather and namesake of the writer, in whose family the conviction remained, not surprisingly, a live issue for years. It is equally unsurprising that Dr Finnegan writes with considerable detail on the story, drawing upon on primary sources such as court and local government records, and newspaper articles, giving a forensic account the trial, the prisoners’ subsequent time in prison, and their lives upon release. Pat Finnegan seems to have been a natural target for arrest on account of his involvement in the Land League. The case of the other accused, Michael Muldowney, was even more arbitrary – an RIC Constable with an impeccable record, Muldowney inadvertently incriminated himself by placing himself in the company of another suspect on the night of the murder. With such poor investigatory standards being applied, there was little hope for a better trial. Indeed, trials were as much a political issue as anything in Ireland then, and Dr Finnegan shows his strengths as a researcher as he methodically examines the trial practices at the time, such as ‘jury packing,’ where jurymen were selected on the basis of religion, so that juries consisting predominantly of Protestants oversaw cases of Catholic defendants. Some queasy black humour can be gained from when Pat Finnegan, still under sentence of death, met the man assigned to be his executioner – professional hangman James Berry – in a train compartment en route to prison. That was not the end of the matter: Barry was assigned a room in the prison above the cell where Finnegan was kept – in a move one could charitably attribute to thoughtlessness rather than malice on the part of the prison authorities – from which the condemned man could hear his executioner’s whistling and singing. Berry went on to publish a memoir, which morbid curiosity prompts one to wonder whether it is still available. As is perhaps inevitable, more attention is given by the book on the accused than on the victim. The Land War has been described as one against ‘Landlordism’ and the eviction of helpless families by uncaring authorities. But in the case of Peter Doherty there is nothing to indicate that he was particularly wealthy beyond his ability to purchase the acres in the first place, leading one to wonder if the other family seeking the land, the Morrisseys, were simply more influential in the area and able to use the Land League as their private instrument. But Dr Finnegan tells a human story, not a historical narrative, and he refrains from such speculation to focus instead on the various individuals involved. Dr Finnegan is scrupulous in detail as he follows what became of participants in the trail after it was done, such as SI Alan Bell – the key mover in the prosecutions, promoted for his work in the case and later assassinated in 1919 while investigating the financial affairs of the IRA – or the two informers from the trial. Neither was particularly popular afterwards, and both ended up moving abroad with one, John Moran, reduced to living rough in Chile and writing letters of appeal for money to Dublin Castle. “Although Moran’s fate is a sad one, it is difficult to conjure much sympathy for a man whose perjury condemned two innocent men to death,” Dr Finnegan concludes, though one suspects his actual feelings to be a lot stronger. Convictions for the murder proved to be of poor comfort to the Doherty family, who continued to be boycotted and eventually they likewise had to emigrate. After the release of the two defendants, Muldowney moved abroad where he made peace with the injustice done against him. Pat Finnegan maintained a lively interest in the politics of the day, becoming more radicalised – much like Ireland itself – moving his support from the Irish Parliamentary Party to Sinn Féin and at last to Fianna Fáil, in a Free State that implemented laws strengthening the Land Commission, thus putting paid to the same issues of land reform and landlordism that had shaped, willingly or otherwise, much of his adult life. 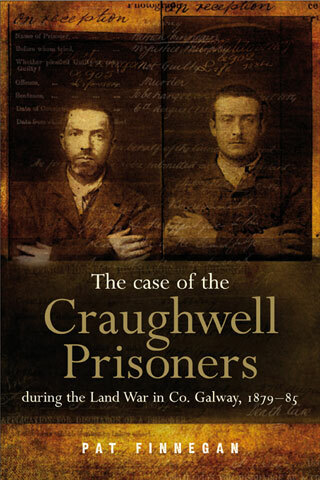 The case of the two men remains a symbol for the time, with all its uncertainty and strife, and Dr Finnegan’s study of it should be a useful accompaniment to anyone interested in the era.